Mangaluru, June 27, 2017: Reports say that the two-day Mahindra Monsoon Challenge that started in Mangaluru on June 24, Saturday culminated at Panaji in Goa on June 25, Sunday with Sanjay Takle and co-driver M.K. Mohammed Musthafa winning the open class. The rally was conducted on time, speed and distance (TSD) formula and those completing the specified distance within specified time would emerge winners. The two with a cumulative two-leg penalty of 61 seconds outclassed their nearest rivals Ravindra Kumar and M. Sagar, who logged 88 seconds penalty in two legs. Though V. Santosh Kumar and T. Nagarajan too had 88 seconds cumulative penalty, they were placed third as they had clocked six zeros in time control zone as against Ravindra Kumar and Sagar, who had scored seven zeros. On day one, the rallyists covered Moodbidri, Kollur before halting at Murdeshwar. On day two, they headed to Panaji, not on National Highway 66, but through the verdant Western Ghats, covering Yana, Kumta and Karwar. Vinay B.P. and co-driver B.M. Ravi Kumar emerged winners in the Challenge category with two penalties of 75 seconds. They were followed by Raghavendra Pidamale and Muralidhar Raj with 231 seconds penalty and N. Maheshwaran and N. Murugan with 240 seconds penalty. In the corporate category, Santhosh Kumar and co-driver Pradeep Nagaraj with a total penalty of 5 minutes 56 seconds came first followed by Baiju Stephen and Kumar M. with 9 minutes 17 seconds penalty and R. Umashankar and S.N. Shanmuga with 15 minutes and 55 seconds penalty. In the couple category, the lone entrant, Harsha Fredrick and Heldise Precilla, finished with penalty of 38 minutes 16 seconds. Among the media category, Rohan S. Patil and Omkar A. Kulkarni finished first with a total penalty of 13 minutes two seconds. K. Balamurgan and T. Vijay came second (47.7 minutes) and Abhishek Chaliha and Kirti Patil third (2.04.09 hours). 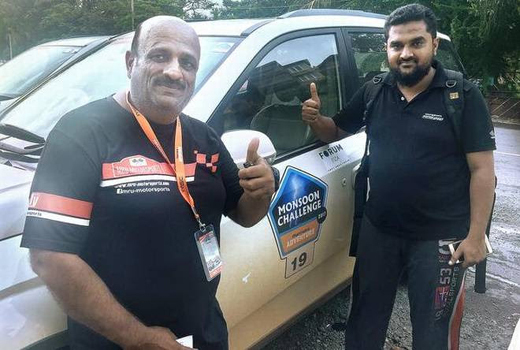 Ace national rallyists Ashwin Naik and Moosa Sharief had prepared the course for the Monsoon Challenge.